Cycling fans in Carbondale cheer on riders as they make their way from Weant Avenue to Highway 133 during Stage 2 of the USA Pro Challenge on Tuesday. Hundreds of people lined the streets of Carbondale to cheer the riders, who were on their way to Crested Butte to finish the stage. •Stage 1 features a circuit race in Steamboat Springs on Monday, Aug. 17. The 49-mile circuit will be completed twice by the racers. The route includes great vantage points for spectators in the town as well as county roads outside the town limits. •Stage 2 will take the racers from Steamboat Springs to Arapahoe Basin over Rabbit Ears Pass and Loveland Pass. It will be the race’s first climb of Loveland Pass and first visit to Arapahoe Basin. •Stage 3 starts in Copper Mountain and takes the racers over Fremont Pass, at 11,079 feet in elevation, to start their day. After blasting through Leadville, the route will take the racers around Turquoise Lake before leading back to Highway 24. The racers will make the turn onto Highway 82, go through Twin Lakes then climb the east side of Independence Pass, where King of the Mountain points will be awarded. The race finishes in downtown Aspen after a screaming descent of the pass. The total miles of Stage 3 is 101, with about half coming above 10,000 feet in elevation. •Stage 4 is an encore from the 2013 race, with the rout from Aspen to Breckenridge. The grueling 126-mile route takes the riders over the steeper western side of Independence Pass to start the day, again awarding King of the Mountain points at the summit. The route swings south on Highway 24 to Buena Vista, then climbs up to Fairplay and over 11,542-foot Hoosier Pass at the 111-mile mark. The descent to Breckenridge is interrupted by a tough, short climb up Moonstone Road. •Stage 5 features an 8.5-mile individual time trial in Breckenridge. •Stage 6 and the start of the weekend takes the racers to the Front Range. Stage 6 is from Loveland to Fort Collins on a new and challenging route for the Pro Challenge. The 102-mile route features springs through the flats between Windsor and Loveland, then a series of climbs punctuated by Rist Canyon at 8,008 feet before finishing in Fort Collins. •Stage 7 brings the race to a conclusion on Sunday, Aug. 23, with a route from Golden to Denver over the always-popular Lookout Mountain. The 68-mile race ends in Denver. USA Pro Challenge competitors and fans will double their pleasure on Independence Pass once again this year. The high elevation pass 20 miles east of Aspen was part of the race each year from 2010 through 2013 but wasn’t incorporated into the route last year. It’s back in a big way. Organizers released race details Tuesday. Stage 3 from Copper Mountain to Aspen will take the racers over the east side of the pass before the descent and finish in Aspen. That stage will take place Aug. 19. The next morning, the racers will start with a bang in stage 4 from Aspen to Breckenridge. They will ride over the west side of Independence Pass to start their morning. The race route in 2012 also brought the racers over the east side of the 12,095-foot pass in one stage, then over the west side the next day. Aspen cyclist and racing fan Erik Skarvan has consistently lobbied for Independence Pass to be a fixture on the professional race’s route, which is held exclusively in Colorado. Skarvan welcomed the news that the race will cross the pass twice again this year. “You just can’t argue with the epic nature of that climb,” he said. A high-altitude pass not only rallies the fan base but it’s also a rush for the competitors, Skarvan said. They need the adrenaline buzz they get from throngs of fans lining special sections the race route, particularly if they are struggling with the elevation. Aspen bike shop owner and racing fan Charlie Tarver said it’s “awesome” that the race will cross Independence Pass twice again. “In any stage race, a mountain like this on any day can affect the overall standings,” he said. He noted that oxygen is depleted by 3 percent for each 1,000 feet above sea level. At the summit of Independence Pass, it’s depleted by about 36 percent. 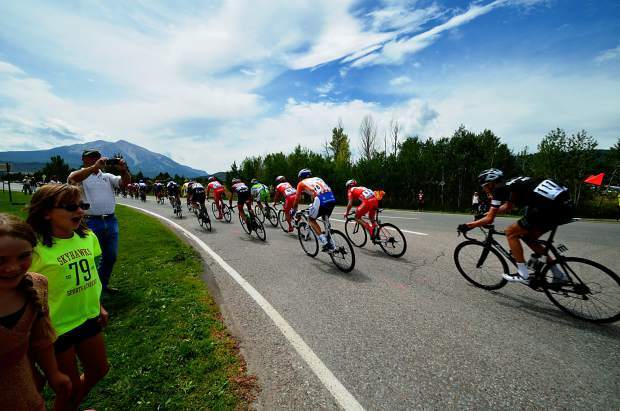 Alpe d’Huez is the iconic steep pass in the Tour de France, the world’s highest profile bicycle race. Its inclusion in the race always brings great anticipation. Tarver believes Independence Pass can gain that same aura in American stage racing. It’s got history in bicycle racing from the 1970s and 1980s with the Alpine Cup and Coors Classic. Aspen cycling fan Mike Tierney said the USA Pro Challenge needs to take advantage of the many high elevation road routes in Colorado to make its mark in cycling. Independence Pass should be an important part of that branding. He would like to see an individual time trial on Pike’s Peak and Mount Evans, two peaks that exceed 14,000 feet in elevation that also have good roads to their summits. That could really push the world’s best bicycle racers to their limits, he said. Tierney said he anticipates the Independence Pass crossings to be big draw for fans. He said he will target Stage 3, the day the racers will charge up the east side of the pass before the descent and finish in Aspen. It’s likely the best climbers will try to use the high-elevation pass to their advantage of the climb and distance themselves from the peloton. Last year Aspen hosted a circuit race, then hosted the start of a stage that headed downvalley on Highway 82 and crossed McClure Pass and Kebler Pass en route to Mount Crested Butte. While McClure attracted overnight campers and daytime spectators, the scene lacked the pizzazz of the typical scene on Independence Pass. “It’s a huge party up there. It’s really fun. People will definitely target (the summit),” Tierney said of Independence Pass. Tierney is one of Aspen’s most visible race fans. He rode his unicycle to the top of Independence Pass each of the years it was incorporated into the race. He looks forward to a return. Hundreds of people ride their bikes to the top of the pass to cheer the racers as they power up to the summit. “All the people riding up from Aspen — that’s the epic nature of it,” Skarvan said. USA Pro Challenge CEO Shawn Hunter said it was important to get Independence Pass back on the route, though taking a break last year wasn’t necessarily a bad thing. The pass didn’t fit logistically into the route that was arranged last year, but its absence might have made race fans’ hearts grow fonder, he suggested. “I think it’s been kind of an iconic part of our brand from day one,” he said of the races over the pass. Independence Pass provided a top three moment of the five-year-old race in the first year when the racers climbed the east side of the pass and encountered a throng of people unmatched in more recent years. “At least in our part of the world, it’s an iconic climb,” Hunter said, noting it’s a long climb and tops out above 12,000 feet, twice as high as almost every pass in the Tour de France. “The riders enjoy it. I don’t know that they look forward to it,” Hunter said.